And the winner is….Rory Allison “I love me a pumpkin cookie that my wife makes. It is more cakey then cookie but with hot chocolate it is divine.” Congrats Rory! 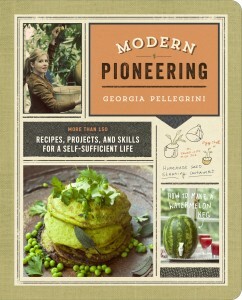 Email me at georgia at georgiapellegrini dot com to claim your prize! Here is a fun treat for a Thursday. A double giveaway. Since the holidays are coming up, I’m doing a few more giveaways than usual. Because I don’t know about you, but I always need an extra gift on hand for those last minute parties. I know it’s surprising, but it’s true. They have a blog called Three Many Cooks, and their names are Pam, Maggy, and Sharon. 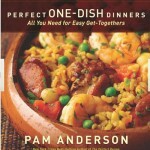 Pam just published a cookbook called Perfect One-Dish Dinners: All You Need for Easy Get-Togethers. 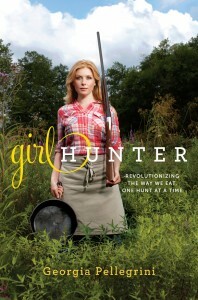 And so we swapped books, I gave her a copy of Food Heroes and she gave me a copy of her book and we made recipes. And just for fun, now we’re doing a grand ‘ol giveaway. So scroll down to the bottom and enter the giveaway for a chance to win a copy of Pam’s fab book. 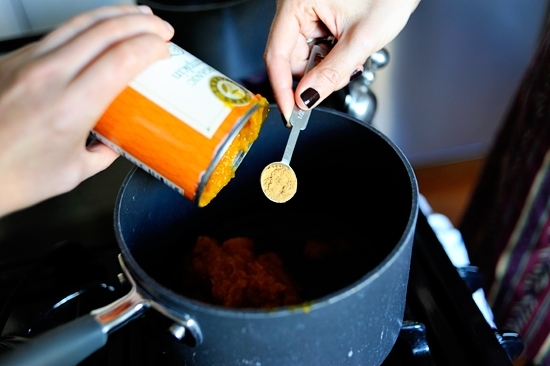 And click on over to Three Many Cooks for a chance to enter a copy of Food Heroes! 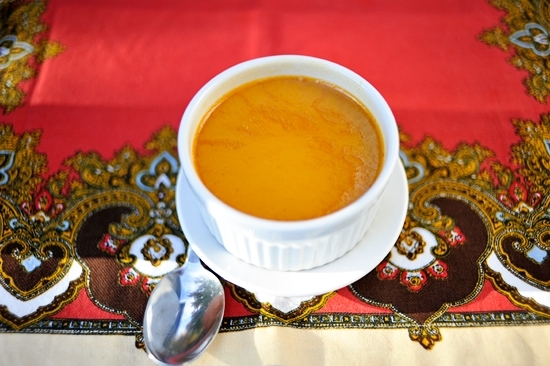 And on the way, take note of this pumpkin custard recipe that is perfect for Fall and for these holiday months. I loved how simple it was and how it didn’t require much time or any complicated ingredients. Just the way a good dessert should be. And the house smelled nice. Very, very nice. Another requirement for a Fall dessert. 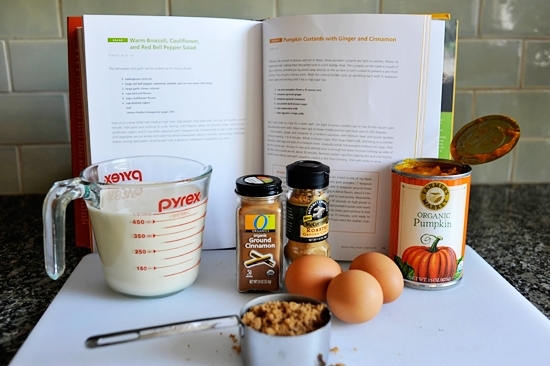 6 simple ingredients: eggs, brown sugar, cinnamon, ground ginger, pure pumpkin, evaporated milk. 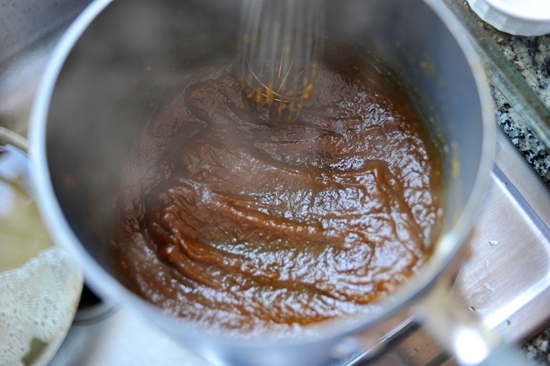 Pumpkin puree and ginger and cinnamon go into a sauce pot. 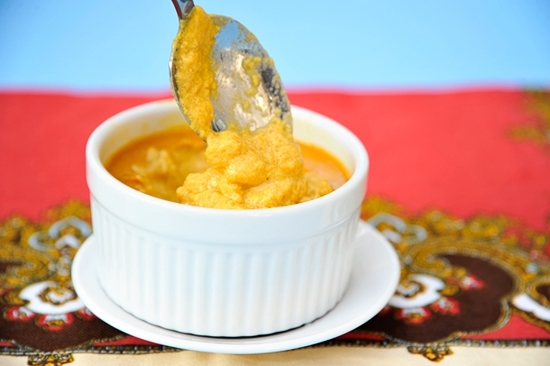 You whisk it to warm up the puree and make the flavors more potent. Then you whisk in the brown sugar. And then you whisk in the evaporated milk. 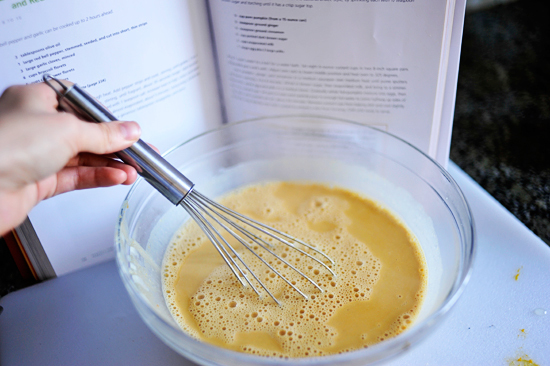 Set it aside and separately whisk together the egg and yolks. 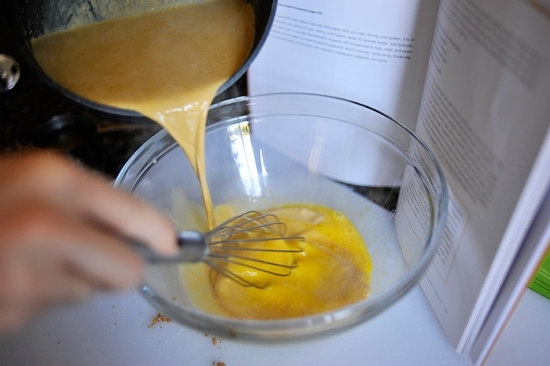 Then with the milk and pumpkin mixture a little cooler, whisk it into the beaten eggs. It will look like so. 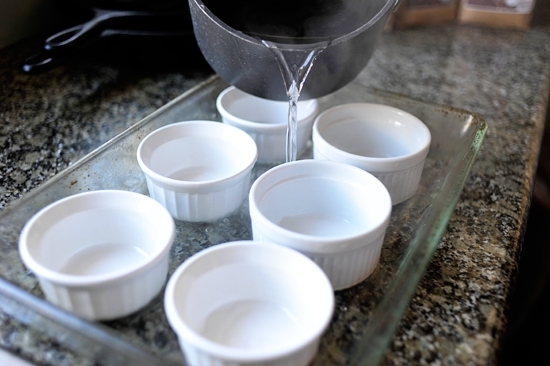 Separately, bring some water to a boil and set ramekins into an oven proof dish and fill the water halfway up the sides of the ramekins. Pam suggests 6 ounce ramekins, and disposable ones work as well. But for a dinner party these white ones look nice. Mine were a bit bigger than 6 ounce, so I just used six rather than the eight that you’ll get with the 6 ounce ramekins. 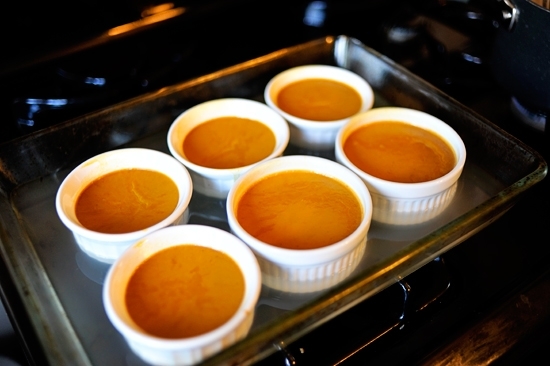 Place your ramekins and water bath onto the middle rack of the oven and ladle in the pumpkin mixture. Fill them up to the top and slide them carefully in. They are ready when they only slightly jiggle. You don’t want a big jiggle, just a little one. Kind of like how you want your belly. And the orange color will be bright and pumpkiny. And you’ll want to eat them for breakfast, lunch, and dinner. Because let’s be honest, pumpkin is good for you and it’s important to incorporate it into your life whenever possible, right? That’s what I told myself over breakfast. To enter the giveaway, simply answer this question in the comments: What is your favorite Fall dessert? Is it pumpkin pie? Pecan pie? Cream puffs? Apple strudel? And you’re automatically entered to win. Winner will be announced Monday after 5pm PST. 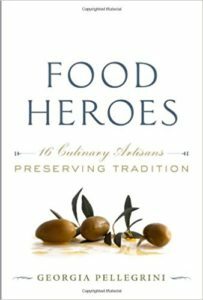 And hop over to Three Many Cooks to enter to win a copy of “Food Heroes” while you’re at it. Bring 1 quart of water to a boil for a water bath. Set eight 6-ounce custard cups in two 8-inch square pans. 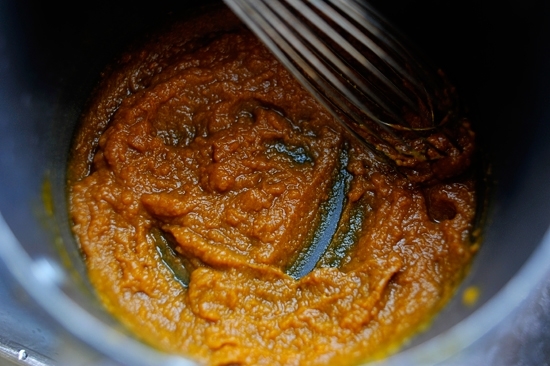 Heat pumpkin, ginger, cinnamon in a medium saucepan over medium heat until puree sputters and flavors intensify, 3 to 4 minutes. 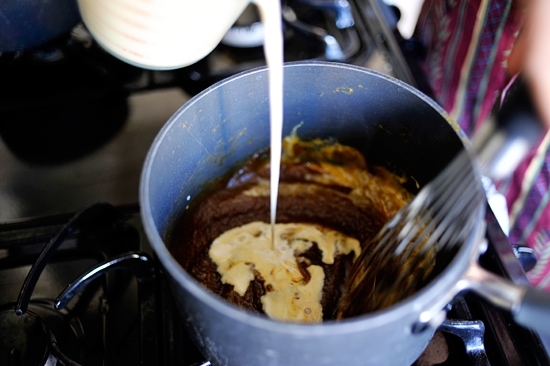 Whisk in brown sugar, then evaporated milk, and bring to a simmer. 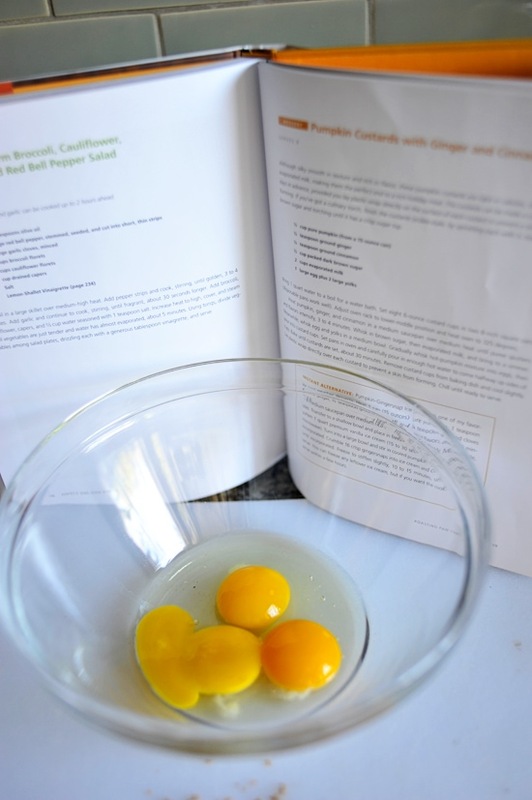 Meanwhile, whisk egg and yolks in a medium bowl. 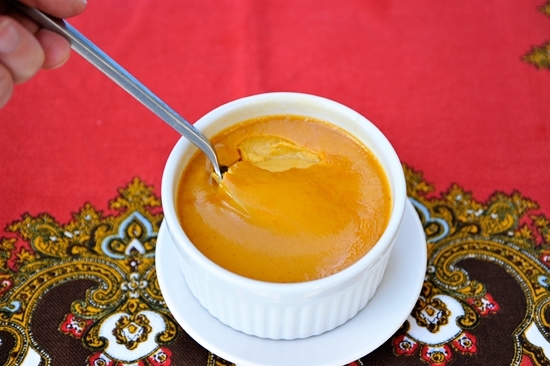 Gradually whisk hot pumpkin mixture into eggs, then pour into custard cups. Set pans in oven and carefully pour in enough hot water to come halfway up sides of cups. Bake until custards are set, about 30 minutes. 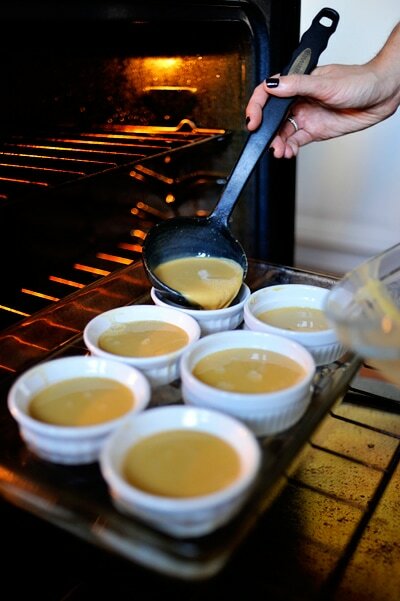 Remove custard cups from baking dish and cool slightly. Lay plastic wrap directly over each custard to prevent a skin from forming. Chill until ready to serve. Apple pie is my favorite fall dessert. 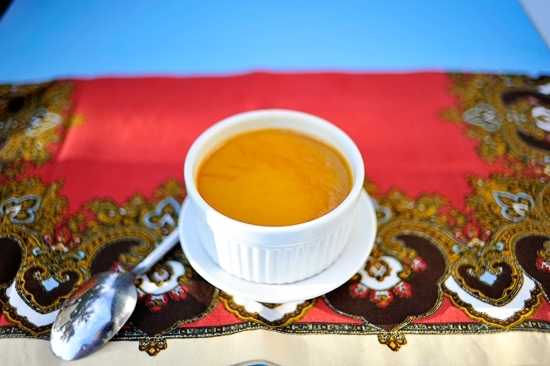 That pumpkin custard is beautiful, such an easy thing to make and the BEST shade of orange! My favorite Thanksgiving dessert is just regular old apple pie with a piece of cheddar cheese. Thanks for the generosity GP! Apple Cake! With applesauce and apple slices. Delicious! I love brownies in the fall. And the summer. And in the spring. And winter too! Pioneer Woman's Pecan Pie and sauce….new absolute favorite!!! Really any thing with pumpkin in my favorite, but I'd say pumpkin brownies are especially good. I might be saying that because I have a batch sitting in my kitchen, ready for scarfing. Pumpkin Brownies?? That sounds good. Can you post bake with the recipe? Oh, that's a tough one. I would say it would be between a home-made pecan pie or my sister's cream cheese pumpkin pie. Happy holidays everyone and good luck! Pecan Pie, put only my mom's. She makes the best crust. 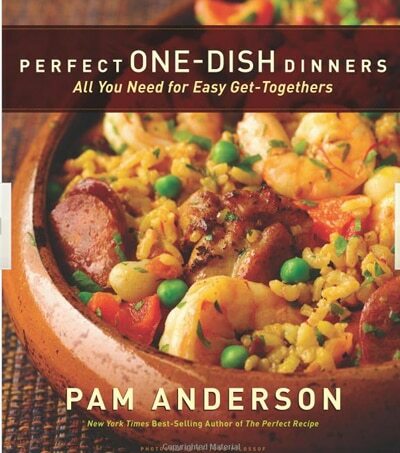 That looks like paella on the cover of the book I'd like to win. I love pumpkin pie, especially for breakfast. apple dumplings! Mmmmm! So good! It has to be my Hungarian Grandmother's Apple Strudel! I've never tasted anything else like it! She was a wonderful cook and I'm only sorry that I never got the chance to learn it from her before she passed away. Happy Holidays! It's hands down pumpkin cheesecake!! Definitely apple crisp – but we seemed to have missed "fall" this year in Cleveland! I love the pumpkin custard (no crust needed), my mom's apple pies and my apple crisp (with vanilla ice cream of course! Hi! I was just about to make this recipe, but I couldn’t find what to set the oven on. I probably just over looked it, if so I appologize!